Carlos Zambrano got tossed from a game for the fourth time in his career yesterday, and it was quite a doozy. The play at the plate was extremely close and Carlos should have at least questioned it. And the umpire actually bumps ‘los before he pushes him away, so Zambrano has a reason to be upset over being tossed. However, what he does after the ejection is completely bonkers but what fun for us to watch. How to get AppleCare cheap? The answer is eBay. Like many but not enough people, I understand that extended warranties are, statistically, a rip-off. The odds are that I’ll pay extra for the warranty and then never use it. Best Buy, among others, makes a killing from selling its customers on extended warranties. However, I have one weak spot when it comes to extended warranties—well, two actually when you count that for car warranties—AppleCare. Ever since my PowerBook G3’s motherboard failed and left me high and dry back in the fall of 2001, I’ve consistently bought AppleCare for my subsequent Mac laptops. Sometimes I’ve needed it, and sometimes I haven’t. And despite that mixed record, I just purchased AppleCare for my MacBook Pro, whose standard one-year warranty expires in a couple weeks. (Apple gives you one year from the original date of purchase to add AppleCare to its products.) AppleCare for the MacBook Pro and formerly the PowerBook is most expensive extended warranty that Apple sells at $349 for an additional two years of coverage. However, no one should pay full price for any Apple Care package. But how do you avoid paying full price? Well, that’s easy: buy AppleCare on eBay. I just got AppleCare for my MacBook Pro for $127. If you are patient and willing to following the auctions for a couple weeks, you should be able to find a similar deal. If you’re not, most Buy It Now prices for the package hover around $160-$170. That’s still a savings of over 50% off the normal retail price. How is this possible? The answer I’ve heard is that Apple requires its resellers to meet quotas for AppleCare sales and many of them end up dumping the warranties at low prices to meet those quotas. You can even find AppleCare for the iPhone, which normally sells for $69, for around $40 on eBay. So, if you feel compelled to buy an extended warranty for your Apple product, eBay is certainly the way to go. *Update* Consumer Reports has found that buying AppleCare actually is worth its cost. Nonetheless, why pay full price when you don’t have to? 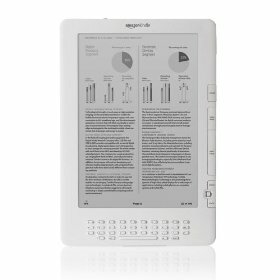 I eagerly read the news this morning about Amazon’s new, larger Kindle DX. The larger screen and the PDF capability seem to make it an ideal reader for not only newspapers and magazines, but also for books and and Word files and, well, nearly everything. The thought of 200-page books becoming 500-page books on the Kindle 2 never sat well with me, but it looks like the Kindle DX could preserve the original page dimensions for most books, which is great news. However, the problem I have with the Kindle is that it simply doesn’t make economic sense as a replacement for the publications I read. I subscribe to two magazines that are available on the Kindle—the New Yorker and the Atlantic—and sometimes subscribe to several others that aren’t, including the New York Review of Books, Elysian Fields Quarterly, the Believer, McSweeney’s, n+1, the Paris Review, I.D., and Open City. I also read the New York Times on a daily basis and am often a print subscriber. So, let’s see how switching to reading my subscriptions on the Kindle DX would work out. The initial cost of the Kindle is $489. I would also probably purchase the extended two-year warranty for an additional $109 because I’m a sucker for those things. I would probably purchase some sort of case for the device, but won’t include that cost here. Throw in sales tax of 8.25%, and you have an initial Kindle cost of $647.33. That’s a lot of money for a reader, but is it worth it? Well, let’s see. Subscribing to the New Yorker on the Kindle costs $2.99/month, the Atlantic $1.25/month, and the New York Times $13.99/month. I currently pay $29.99/year for the New Yorker, so I’ll just assume that there’s no cost savings at all for that magazine. I pay $24.90/year for the Atlantic, which works out to a savings of $0.79/month. Now, I’m aware that it’s not entirely fair to compare cash flows for a yearly magazine subscription paid all at once and the monthly Kindle costs, but it doesn’t make much difference in this example. Finally, let’s assume a print subscription cost of $30/month for the New York Times. Given the Times’ frequent promotional offers and my tendency to alternate between seven-day, Sunday-only, and weekend-only subscriptions, I think that value is fair enough for these purposes. Switching to the Kindle edition of the Times produces a monthly savings of $16. Now, let’s assume an annual discount rate of 6% in better economic times. With a monthly savings of $16.79, it would take nearly four years before you broke even on the original cost of the Kindle. Four years from now, your extended warranty will be expired and your battery shot. It doesn’t seem like a very good deal. Let’s include books in the mix and say that I purchase one new Kindle book each month, saving $6/book over Amazon’s existing hardcover prices. Even then it’ll take me two years to break even on the purchase price, by which time my Kindle DX will be obsolete. So, the Kindle never really generates any sort of sustained savings over its traditional media equivalents, at least for me. I’m aware that I’m not considering the value that users might put on the Kindle’s convenience and other features. Likewise, I’m not considering the premium that readers might put on traditional books—and the ownership rights, longevity, portability, and tangibility that come with them—either. Are any of those enough to make up for the shortfall? Or do they only swing the pendulum further against the Kindle? I have no problem with paying for digital content and the convenience that comes with it. In fact, I would probably prefer a less expensive device and more expensive content. At its current price-point, the Kindle DX is only going to attract early adopters and is far from becoming a product for the masses. A recent study from the American Association of Wine Economists has been receiving online attention for its claim that people can’t tell the difference between paté and dog food. However, in the study, subjects still consistently identify the dog food as the worst tasting of the bunch. Then why don’t they go on to pick it as the dog food from the paté samples they taste? The problem is that asking subjects to identify the dog food is asking them to think too much about a question that doesn’t really require any deep thinking. If it tastes bad, it tastes bad, and thinking about it only allows you to convince yourself that it’s not that bad (or that your idea of dog food isn’t that bad). This tendency was best exemplified by a study performed by Timothy Wilson at the University of Virginia. He asked college students to rank a series of different strawberry jams. The students’ rankings were accurate when they only had to consider which one they like best. However, when Wilson asked them to consider more specific aspects, such as each jam’s texture, their rankings no longer reflected their own (or experts’) jam preferences. Thinking about these other, irrelevant factors prevented them from making accurate calls about the jams. The point: if you know something tastes bad, it doesn’t really matter what it is or how consistent its texture and color. It still tastes bad, even though they might fool you into thinking otherwise. Apparently, Jonathan Lethem handed out CDs containing his own personal soundtrack to The Fortress of Solitude after the novel came out back in 2003. The Millions was able to unearth the track listings on the Internet Archive, but the Archive’s page is now down. So, I’m posting the track listings here in the hope of preserving them a while longer. Margaret Talbot published an excellent piece about neuroenhancers in last week’s New Yorker. One of the drugs that Talbot cites and whose use has spread this decade is Modafinil, which I wrote about back in 2002. I said, “The existence of a wonder drug that could abolish a person’s need for sleep … should be just as impossible as it sounds.” As I feared, off-label use of the drug has only increased since I wrote that. And even neuroethicists have moved towards endorsing cognitive enhancement. Every era, it seems, has its own defining drug. Neuroenhancers are perfectly suited for the anxiety of white-collar competition in a floundering economy. And they have a synergistic relationship with our multiplying digital technologies: the more gadgets we own, the more distracted we become, and the more we need help in order to focus. The experience that neuroenhancement offers is not, for the most part, about opening the doors of perception, or about breaking the bonds of the self, or about experiencing a surge of genius. It’s about squeezing out an extra few hours to finish those sales figures when you’d really rather collapse into bed; getting a B instead of a B-minus on the final exam in a lecture class where you spent half your time texting; cramming for the G.R.E.s at night, because the information-industry job you got after college turned out to be deadening. Neuroenhancers don’t offer freedom. Rather, they facilitate a pinched, unromantic, grindingly efficient form of productivity. There’s a much cheaper way to achieve productivity that we inexplicably gave up in the name of progress. It may be painful, but it’s worth a shot: Turn off your cell phone, unplug your wireless router—I know it feels strange, but vaguely familiar like how things used to be—sit down at your desk, and get to work. I first met Zadie Smith in the summer of 2001 at a book signing in San Francisco. I waited in line with a friend for her to sign my first (American) edition of White Teeth. After she did, my friend, who didn’t have a book, approached her, and she signed his right arm. She also drew a dotted line around it and wrote “Cut Here.” I love her work for that very sensibility and humor.